Red Cherry (Feather) F002 (F 002) (also known as Red Cherry FAUV FUR RED False Eyelashes) are angled navel red & little black feathery faux lashes. Not actual feathers. Red Cherry (Feather) F003 (F 003) (also known as Red Cherry FAUV FUR AUBURN False Eyelashes) are angled dark reddish brown feathery faux lashes. Not actual feathers. 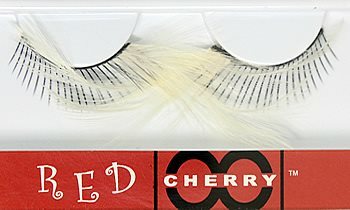 Red Cherry (Feather) F004 (F 004) (also known as Red Cherry FAUV FUR BROWN False Eyelashes) are angled dark blackish brown feathery faux lashes. Not actual feathers. Red Cherry (Feather) FBLK Lashes comes with natural black false lashes with vibrant corner BLACK feathers to make eyes pop. 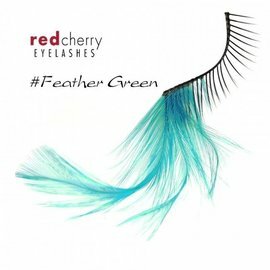 Red Cherry (Feather) FGRN Lashes comes with natural black false lashes with vibrant corner GREEN feathers to make eyes pop. Red Cherry (Feather) FPNK Lashes comes with natural black false lashes with vibrant corner PINK feathers to make eyes pop. Red Cherry (Feather) FWHT Lashes comes with natural black false lashes with vibrant corner WHITE feathers to make eyes pop.